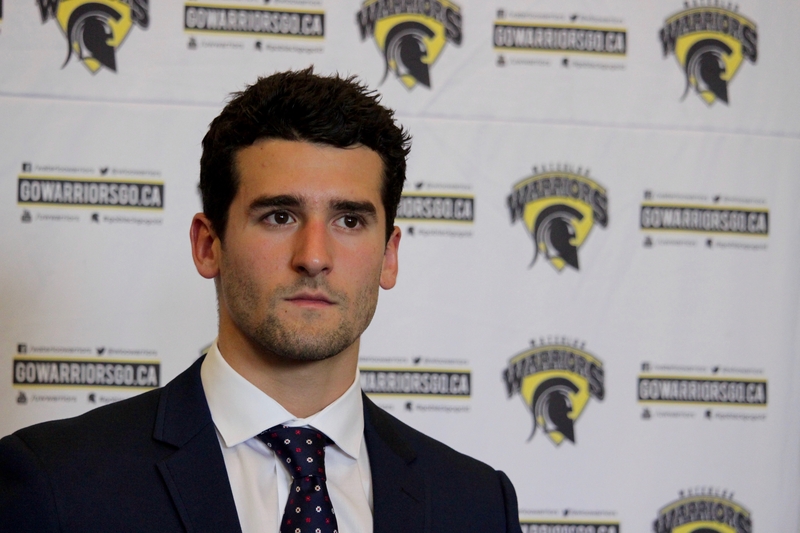 Ben Fanelli is ready to take on a new challenge as the Waterloo Warriors prepare for their season opener against the Guelph Gryphons on Wednesday, Oct 5 in the newly renovated Columbia Ice Fields Arena. Fanelli, a former captain of the Kitchener Rangers, the local Canadian Hockey League (CHL) team, was hired as an assistant coach and Warriors hockey camp co-ordinator in the offseason. Fanelli hopes to pass along some of the tips he learned from his mentors throughout his time with the Rangers. Fanelli is well known in the Waterloo Region for what he’s been able to accomplish on and off the ice. As a 16-year-old playing for the Rangers, Fanelli received a brutal hit by then Erie Otters’ forward Matt Liambas that fractured his skull. Doctors believed Fanelli would never play hockey again, but against all odds, he went onto play three seasons for the Rangers, including the 2013-14 campaign where he was awarded captaincy honours. Fanelli went onto co-found EMPWR, an organization created to advance the recovery of concussion injuries. Fanelli believes some of the skills he acquired as a captain and through his role with EMPWR will translate well behind the Warriors bench. “I learned about the value in positivity behind the bench, team camaraderie, pulling on the rope in the same direction, and how to work towards that, both on the ice and off the ice,” he explained. Fanelli has one particular date circled on his calendar. A Nov 2 battle against the Wilfred Laurier Golden Hawks at the Kitchener Memorial Auditorium, the home of the Kitchener Rangers. Fanelli, currently finishing his communications degree at Laurier, is excited about getting to coach against his former teammate, Derek Schoenmakers. This edition of the Warriors is going to look much different from last season. As is the age-old problem with university sports, athlete turnover is constant and four of the Warriors top-seven scorers from last season won’t return. The biggest loss will be Colin Behenna, one of the most notable Warriors in team history who finished third in OUA scoring last season. Fanelli believes Behenna’s departure leaves more opportunity for new players to step-up and fill the big shoes left by the 2016 University of Waterloo Male Athlete of the Year. The Warriors are looking to avenge a first round upset playoff loss to the Ryerson Rams last season. Waterloo might look different this season, but Fanelli and the rest of the coaching staff believes the team has the potential to finish what last year’s team started. In preparation for the season opener against Guelph on Oct. 5, the Warriors finished the preseason 3-1, with wins over Laurier, Laurentian, and Carleton, and loss coming from the University of Miami (Ohio).